Boo got a nail trim yesterday. *shakes head* I have trimmed a few guinea pig nails in my time, and Boo is the absolute worst about nails. When I adopted Twitch and Boo, they both had messed up feet because the humans who "owned" them for the first two years of their lives apparently never trimmed their nails. ugh. Doing Twitch's nails was never a problem. Tho if I was taking too long she would start yelling. 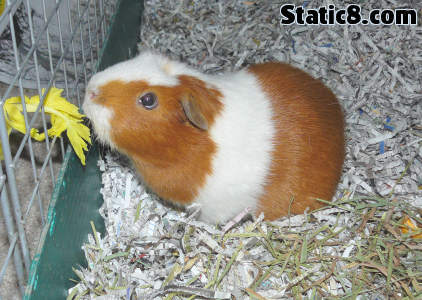 Translation from guinea pig to American English: "Help! She's Killing Me!" But Boo... she squirms: Basically makes it impossible to do her nails correctly. I hate doing it, she hates having it done, but it's a necessity! sighs. Boo usually forgives me in about ten or fifteen minutes... if I do it right. (otherwise it's a day or two!) But yesterday, I got it right! !